Starters Orders 7 is Out! 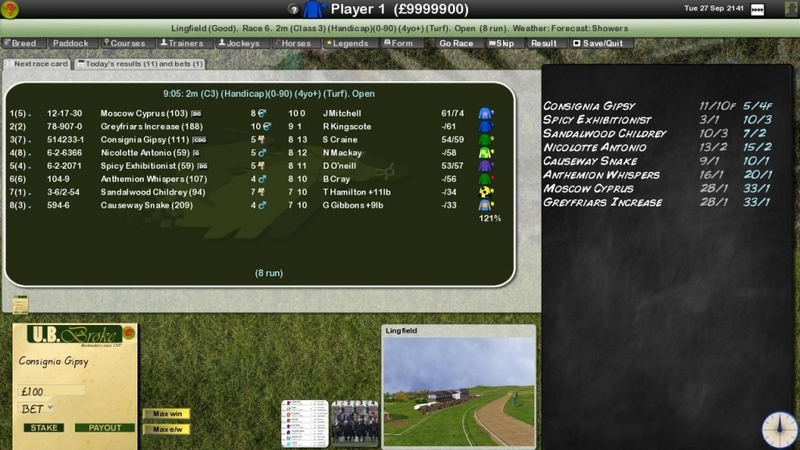 Starters Orders 7 is an in-depth Horse Racing management simulation currently for the PC Only. Train your string of horses and take part in races around the globe. Breed new stable stars. Build your stables and even take the role of the jockey. 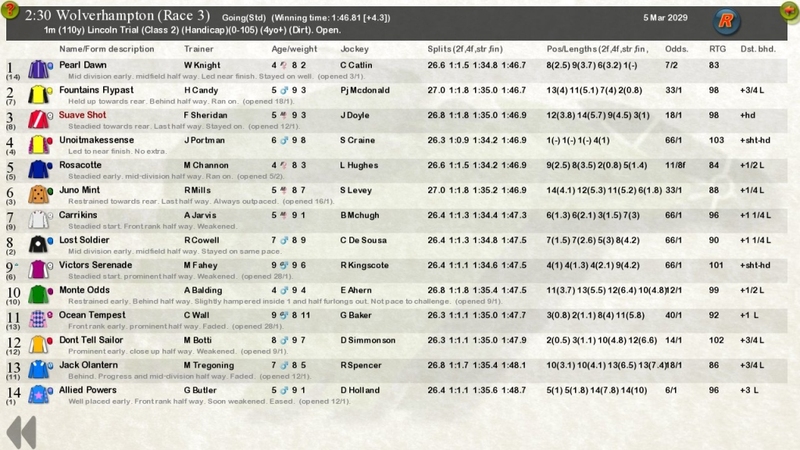 Starters Orders 7 adds a number of new features including in-depth breeding, realistic new dynamic commentary, Newspaper style race and form cards, new racecourses, etc. “THE UNDISPUTED FRANKEL OF HORSE RACING GAMES“. Racing Ahead magazine April 2019. “STARTERS ORDERS IS AN EXTREMELY IN-DEPTH HORSE RACING MANAGEMENT GAME AND DESERVES TO BE MENTIONED IN THE SAME BREATH AS FOOTBALL MANAGER“. Pocket-Lint.com. Starters Orders was voted the BEST HORSE RACING GAME OF ALL TIME. Source: Ranker.comSee the new features added since SO6 › Like us on Facebook to keep up with the latest news! The most realistic horse racing game ever! Fields of up to 40 runners with the most realistic races ever in a computer game! Play hundreds of seasons. Permenant horse records with historical stats. 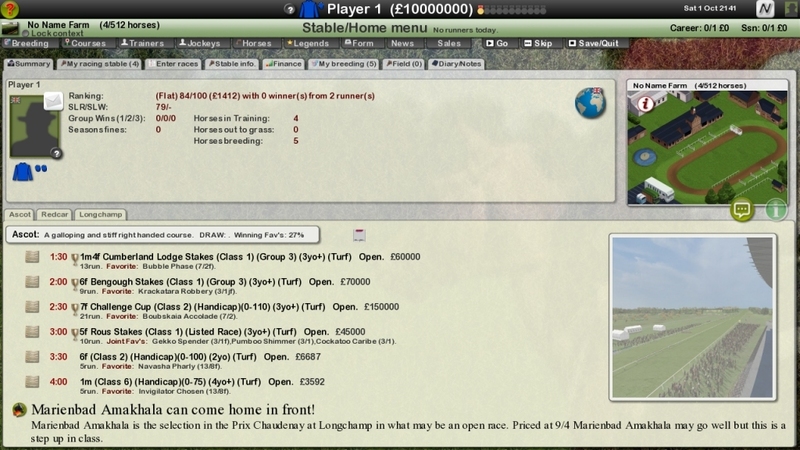 The only game ever to accurately simulate UK jumps racing with a full realistic calendar. Train, own, breed, bet, ride and race in a realistic horse racing world. Legendary horses + editor. Race against legends from the past. Realistic race commentary with a new cutting edge real time speech synthesis engine. Realistic races, betting, jockey and trainer AI! 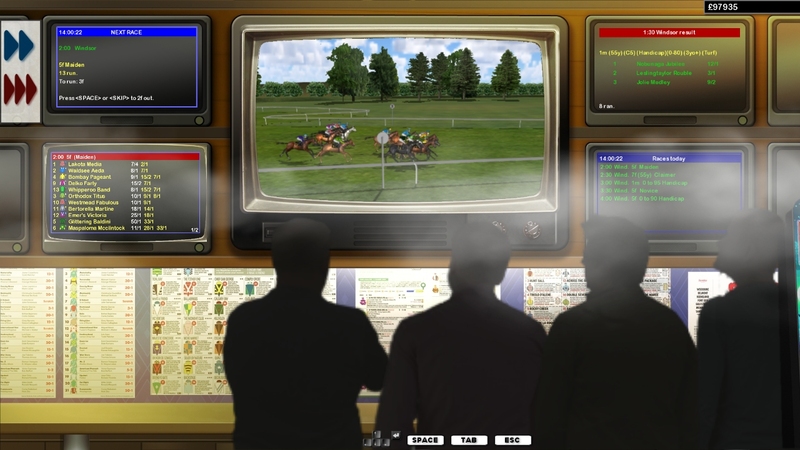 Alternative betting shop race mode low spec option to replace the 3D race sequence. Dynamic never ending horse racing game world. Breed your own race horses or start a stud with your best stallions. Sales. Buy yearlings, race horses, breeders from game trainers. Full horse historical lineage and data! 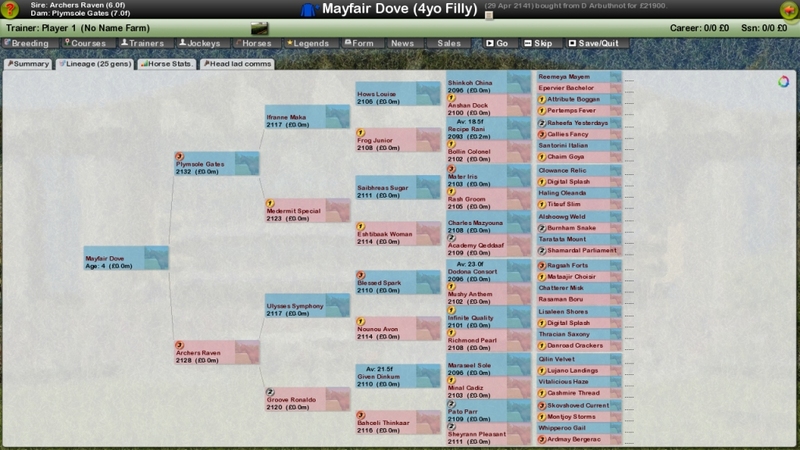 View any horses lineage and data back up to 250 years ! Optional AI owners mode. Train and communicate with realistic owners! Stewards enquiries, non-triers, fines, photo finishes, accurate handicapping etc. etc. Newspaper style race and form cards. Vast custom form book going back up to 20 seasons! More mod friendy. Now possible to add new nationalites, courses etc. Offline management game. No internet required. Pay once play forever! Edit your own schedules. Full race schedule editor included. Run your own breeding operation. Run breeding operations and breed your top mares with top game stallions. 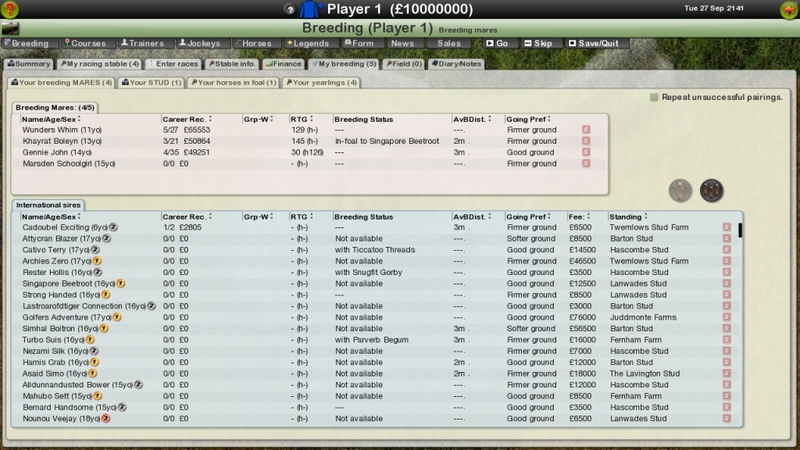 Build a stud and put up your best stallions for offers from AI trainers/owners. 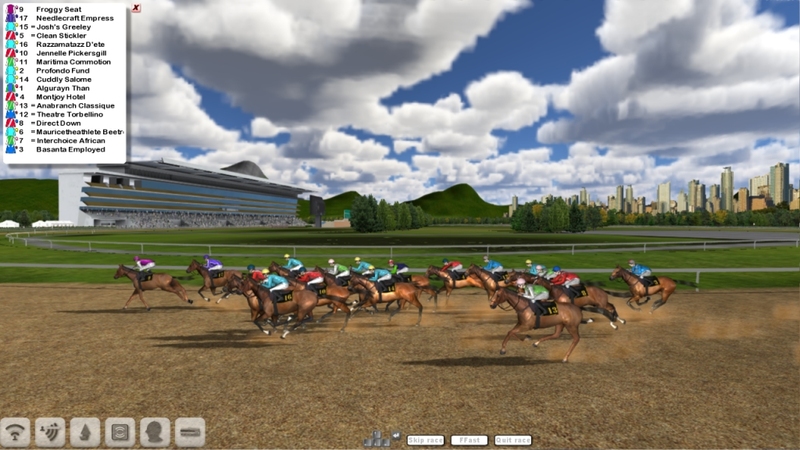 Vast horse racing game world with thousands of horses, hundreds of jockeys and trainers. Race at over 100 racecourses. Improved jockey race AI for the most realistic horse races ever in a game! Hundreds of world-wide premiere races such as the Melbourne Cup and Grand National! South Africa and Singapore added including five new racecourses and related showcase races. Easy to play alone, with friends or others in the online league. Oculus Rift VR headset mode (Available when you choose to ride your own horse). Option to use decimal or fractional odds and meters or furlongs. Currently available for the PC only. Starters Orders 7 is currently in BETA for the PC. This means we intend to continue to develop the game beyond release based on community feedback. If you purchase the game now you will be entitled to all future releases of Starters Orders 7 both before and after the BETA phase finishes. Starters Orders 7 DEMO available! A short Starters Orders 7 BETA DEMO is now available for the PC! Click below to download in zip format (PC only - 1gb) . Launch SO7 and you should see a flashing UPDATE button (bottom-left). Click to download the latest update then install. Starters Orders 7 is released! Starters Orders 7 is now in BETA for the PC! Click below to purchase via this site . It's long overdue but the Starters Orders series now has a brand new website!. Copyright © Strategic Designs Ltd. . All Rights Reserved.